Pocatello is the county seat and largest city of Bannock County, with a small portion on the Fort Hall Indian Reservation in neighboring Power County, in the southeastern part of the U.S. You can plan Pocatello trip in no time by asking Inspirock to help create your itinerary. The Route module shows you all the different ways you can get to Pocatello. In August, daily temperatures in Pocatello can reach 88°F, while at night they dip to 51°F. You will leave for Casper on the 9th (Fri). Casper is a city in and the county seat of Natrona County, Wyoming, United States. Find out how to plan Casper trip without stress by asking Inspirock to help create an itinerary. Drive from Pocatello to Casper in 7.5 hours. Alternatively, you can fly. August in Casper sees daily highs of 86°F and lows of 51°F at night. You'll set off for Keystone on the 10th (Sat). Your day-by-day itinerary now includes Big Thunder Gold Mine, Presidential Trail and Mount Rushmore National Memorial. To see maps, traveler tips, other places to visit, and other tourist information, go to the Keystone tour website . You can drive from Casper to Keystone in 4 hours. When traveling from Casper in August, plan for slightly colder days in Keystone, with highs around 77°F, while nights are about the same with lows around 51°F. Cap off your sightseeing on the 12th (Mon) early enough to go by car to Rapid City. You've now added Reptile Gardens to your itinerary. Kick off your visit on the 12th (Mon): meet the residents at Reptile Gardens and then get your game on at Black Hills Maze. For maps, reviews, other places to visit, and tourist information, you can read our Rapid City driving holiday planning tool . Rapid City is very close to Keystone. Plan for somewhat warmer temperatures traveling from Keystone in August, with highs in Rapid City at 83°F and lows at 60°F. Finish your sightseeing early on the 12th (Mon) to allow enough time to drive to Devils Tower. To see more things to do, where to stay, ratings, and tourist information, read our Devils Tower trip planner. You can drive from Rapid City to Devils Tower in 2 hours. Alternatively, you can do a combination of bus and taxi. In August, plan for daily highs up to 81°F, and evening lows to 56°F. Wrap up your sightseeing by early afternoon on the 13th (Tue) to allow time for the car ride to Medora. Medora is a city in Billings County, North Dakota, United States. 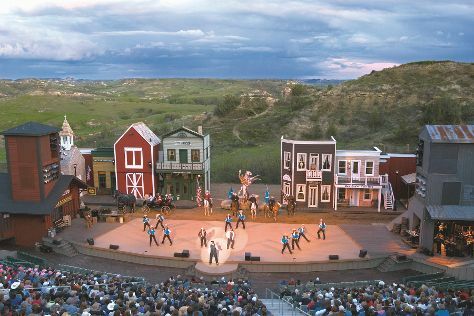 Your day-by-day itinerary now includes Medora Musical. For where to stay, reviews, other places to visit, and other tourist information, read Medora trip itinerary planner . Traveling by car from Devils Tower to Medora takes 4.5 hours. Alternatively, you can do a combination of taxi and bus. Plan for little chillier nights when traveling from Devils Tower in August since evenings lows in Medora dip to 50°F. On the 17th (Sat), you'll travel to Glasgow. Glasgow is a city in and the county seat of Valley County, Montana, United States, with an estimated population of 3,414 as of 2015.HistoryAmerican Indians inhabited the region for centuries, and extensive buffalo and pronghorn antelope herds provided ample food for the nomadic tribes. To see ratings, more things to do, where to stay, and other tourist information, use the Glasgow itinerary builder app . You can drive from Medora to Glasgow in 3.5 hours. Traveling from Medora in August, you can expect nighttime temperatures to be somewhat warmer in Glasgow, with lows of 56°F. On the 16th (Fri), you're off toGlacier National Park. On the 16th (Fri), contemplate the waterfront views at Avalanche Lake. Here are some ideas for day two: take in the dramatic natural features at Grinnell Glacier and then stroll through Highline Trail. To find where to stay, ratings, traveler tips, and tourist information, read Glacier National Park trip planner . 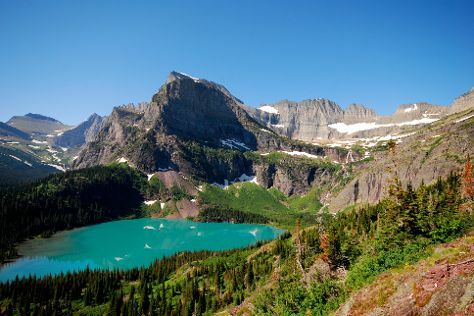 Explore your travel options from Glasgow to Glacier National Park with the Route module. Expect a bit cooler evenings in Glacier National Park when traveling from Glasgow in August, with lows around 48°F. You will leave for home on the 18th (Sun).